netec pump control units type HTR control the brine circulation pump of a brine operated ground heat exchanger highly efficient because continuously temperature controlled by an electronic pulse-width modulation. They provide extremely accurate maintenance of target values ​​for the winter pre-heating and the summer pre-cooling of outer air with minimized electrical power consumption. The purpose of netec developed control of type HTR is to regulate the performance of the brine pump electronically and almost infinitely without loss of between about 1% and 100% of their rated power. The pump capacity is based on the difference between a user-selected temperature and the measured actual temperature of the fresh air behind the brine-air heat exchanger. User interface is an LCD display and three buttons for entering the desired values ​​for winter and summer activity, the query of the actual values ​​and other settings. This is the standard controller for brine operated ground heat exchangers, which has already been proven in more than 3.000 plants. The target value, from when he should warm the outside air in winter or in summer pre-chill, are easily adjustable with three buttons. 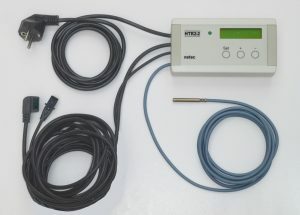 The factory setting is +1 ° C and +24 ° C. The current air temperature and the actual pump output is displayed on the screen when you touch a button. Display language can be settet to German, English and French. The actual Model HTR2-2 is suitable with high efficiency pumps with PWM or with 0-10-Volt controlling. It is ready to plug-and-play if connected with the netec pumps and security group PGR-2. If it shall be combined with other high efficiency pumps, cables and internal settings may have to be modified. How to do this, is explained in the handbook. The HTR2-D controller has the same pump control function as the above described former standard controller HTR2-1. Beside this, it has six sensors and an integrated data logger, which allow, to monitor and to evaluate the performance of a brine to air ground heat exchanger over a full year. 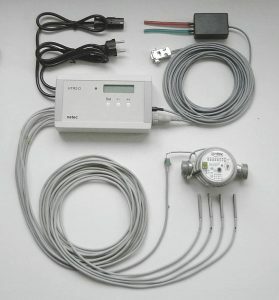 It measures the brine flow rate, the temperatures of the brine supply and return and of the air input and output as well as the ventilation airflow indirectly by the pressure drop in airduct. The control HTR2-D is designed for scientific and technical evaluations.